We’re knee-deep in the heart of winter, and snow is very much on the radar. Since we still have a few months left before temperatures warm up, we have a lot of shoveling and snow blowing ahead of us. But don’t worry—let the pros handle it. You’ve been there before: you wake up an hour earlier on a workday, get suited up, and do a back-breaking cleanup of your driveway before you have to start a day’s worth of work. What a mess, right? Well with professionals by your side, you can catch up on some much-needed sleep before work, and let experts handle the driveway. By the time you wake, you’ll be ready to pull the car out, and head to work safely. Not for nothing, but many of us aren’t plowing experts. We know how to get rid of the snow, sure, but that doesn’t mean we’re doing it in the most cost-effective and efficient manner. But professional snow plowers can. With their know-how and the proper equipment, the work you have to complete will be taken care of in the fastest, most streamlined way possible. Shoveling snow can be dangerous. We can slip, fall or pull a muscle easily when dealing with mounds of snow and sheets of ice—all before we have to leave for work. But by hiring professionals who know how to execute snow removal safely, we provide ourselves with a higher degree of security. If you keep a snow blower or plow in your garage, chances are that you spent a good amount on it and will continue to with its maintenance. But rather than draining your wallet on those tools, you could save money with a snow removal service. Not to mention, professionals understand what’s lying under the snow and ice: your concrete driveway! 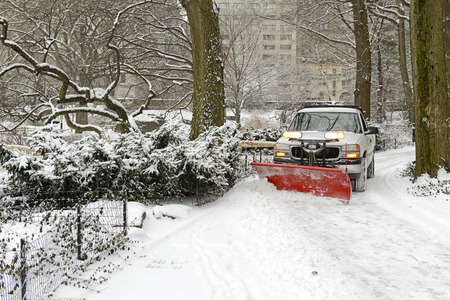 Careless plowing can lead to damaged and cracked concrete, so why not trust a snow plowing team that is composed of concrete experts? Come spring, you won’t be faced with any of those pesky concrete repair expenses. Looking for the right snow plowing team in Cambridge? Trust the concrete and snow removal team at Templin Concrete Construction! Give us a call at 612-388-1945 today to learn more about our snow plowing services.